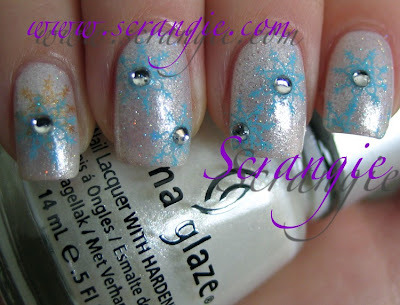 I originally tried to do holo silver snowflakes but they didn't show up at all! So then I tried to do gold snowflakes (you can see it on my pinkie) but it looked to warm and un-snowlike. Finally settled on the baby blue Konad polish and it was perfect. Not much contrast, which I like for this design. Added the gems because it didn't look icy and sparkly enough for me and then the Northern Lights because it still wasn't sparkly enough. I think I like more gems better. So, I guess it's not specifically Christmassy... More like a winter-themed nail art. Ooh, it would even make a great Hanukkah mani, too. I'm thinking I want to do something with a green base on Christmas Day. Maybe start with China Glaze Jolly Holly, then do something with gold and red and jewels? Hm. Better start brainstorming. Happy Holidays to you also, pretty mani i had that in my cart the CG and debated,then it was sold out. so i got the Orly Christmas white-they are real similar. Very delicate and pretty. MC to you and thank you for all your fantastic nail posts this year. This is so beautiful! It just reminds me of snow and happiness! Really pretty!! Perfect winter wonderland mani! *Bounce, bounce* I Looooooooove this so much! I'm not usually much on Holiday or winter mani's but you got my attention. It's beautiful! So pretty! I love all these winter manicures, they're all so pretty. "More gems" is like my battle cry! The manicure is stunning. Have a great holiday! Like the manicure. Nice and snowy looking. Have a very Merry Christmas. Merry Christmas Scrangie! Reading your blog is like a daily Christmas present! very cute, love it. Merry Christmas! OMG I love this one!!!!!!!!!!!!!!!!!!!!!!!!!!!!!!! "We're gonna have a gothic christmas, that is what we'll do, we're gonna have a gothic christmas, hope you'll have one, too ... Santa's going to wear his black dress, just for me and you ... Santa's going to grunt in Latin and slay a dragon or two ... Rudolph, he will change his name, cause Rudolph just sounds really lame, his new name will be Ragnagord, the evil reindeer overloooooord" *hum* ;)) love it. So cool. Great blog, I expect that some of our "toemailers" have been through here before me, lol! Lovely! This reminds me of that limited edition FingerPaints shade. The bottle had blue snowflakes and all. Very pretty! Awesome gift idea: White Castle Candle. Zoya Free Color Spoon Friday!